File under: "I try to become more cynical every day, but lately it's hard to keep up." On one hand, there's a definite value in signaling that China will remain a valued trading partner in a McCain administration. On the other hand, at six bucks a pop there's a future ebay fortune to be made. UPDATE: All things must pass. As of this morning, as noted in the comments, the image at the McCain site has been corrected. OK, so they don't know how to use an apostrophe. That's why it's for students...yeah, that's the ticket. It's a teaching tool. At least McCain's got the students. O'bama has the morons, and the morons have him. I think McCain is reaching for the Ebonics vote. Like, "I's goin' home." equals "I am going home." "Student's for McCain" means "[This] Student is for McCain." Like, student's don't no how to punktiate. OMG. LOL. Missing apostrophe? Not at all! The problem is a missing word, but alas, there was no room in front of "student's" for the obviously forgotten "This." As Liz said. This is a statement of personal affiliation, not the name of a group! Oh, PS: The product image on the McCain website has been corrected. You might want to make a note of that. I thought that it meant that the pen was for McCain. 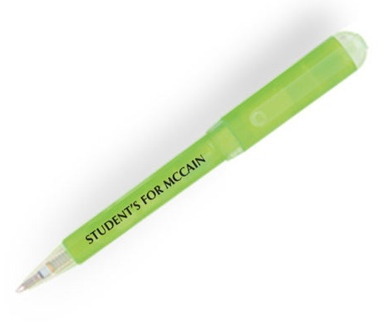 Student's (pen) for McCain.